A drug manufacturer is recalling bottles of thyroid medication because the drug was made with active ingredients that were not sourced to proper FDA standards. 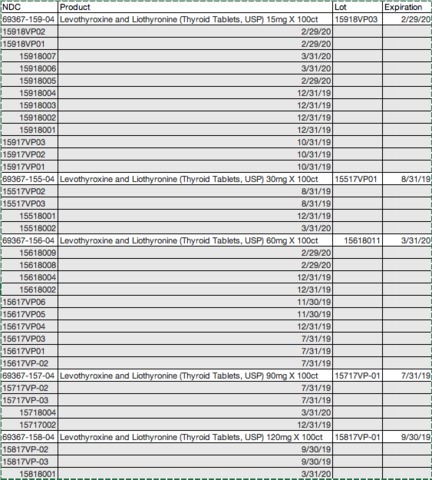 According to the FDA , Westminster Pharmaceuticals issued the voluntary recall last week for all lots of Levothyroxine and Liothyronine. The company says it has not received any reports of any injury or illness related to the recall. The recall includes tablets of Levothyroxine and Liothyronine with the following dosage: 15 mg, 30 mg, 60 mg, 90 mg, and 120 mg. The FDA recommends that patients immediately replace their pills with a new bottle. They recommend that patients continue to take the recalled pills until they are replaced, as the medication could be used to treat serious medical conditions. Westminster is contacting patients directly about the recall. Instructions for returning and replacing the pills will be covered in the recall letter or email. More information on recalled bottles is listed below.